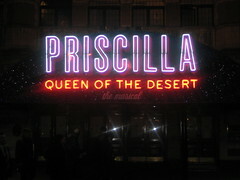 Priscilla was FUN, FUN, FUN! This was a truly euphoric show. The first half burst into your existence like a multi-coloured, spangled extravaganza that assaults all your senses. The costumes were so creative and extravagant. The Tina Turner impersonator was just spot on. Lots of laughs and the expected drag/ gay gags, but these work quite well. There is a bit of sentimentality in the second half but just enough. The score was all the memorable tunes of that time with lots of the audience singing and clapping along. The Bus was the star of the show and the first time a west end audience applauded the arrival of a bus on stage, I think. Must say, Jason Donovan was the weakest link and someone should give him a lesson in walking in heels. The other 2 leads, Tony Sheldon as transsexual Bernadette and Oliver Thornton as Adam/Felicia were sensational. The evening ended all too soon with an expected standing ovation. Big letdown was that there wasn’t the Mama Mia like show at the end for a bit of a boogie. At the Palace Theatre, Shaftesbury Avenue. Written : Book by Stephan Elliott and Allan Scott, based on the 1994 movie. Synopsis : Drag queen Mitzi, and friends Felicia and Bernadette make their own personal journeys of discovery as they go across Australia from Sydney to the outback, in a battered old bus named Priscilla , to perform their show – singing their way through disco songs.